Without school guidance counsellors, on-hands trades courses, or even classroom materials on mining, many youth in Nunavut don’t think much about mines and their job opportunities. Moreover, Nunavut’s operating mines aren’t located near communities and the people who work at them are away when they’re on the job, so it’s hard to connect their good lifestyle and material comforts with the idea of a steady job in mining. To try to correct these shortfalls and ensure young Inuit take some of the many jobs available in the mining industry, the Nunavut Mining Symposium’s organizers reached out to youth, who comprise about 60 per cent of the territory’s population, to teach them more about the mining industry and, at the same time, to learn from them. 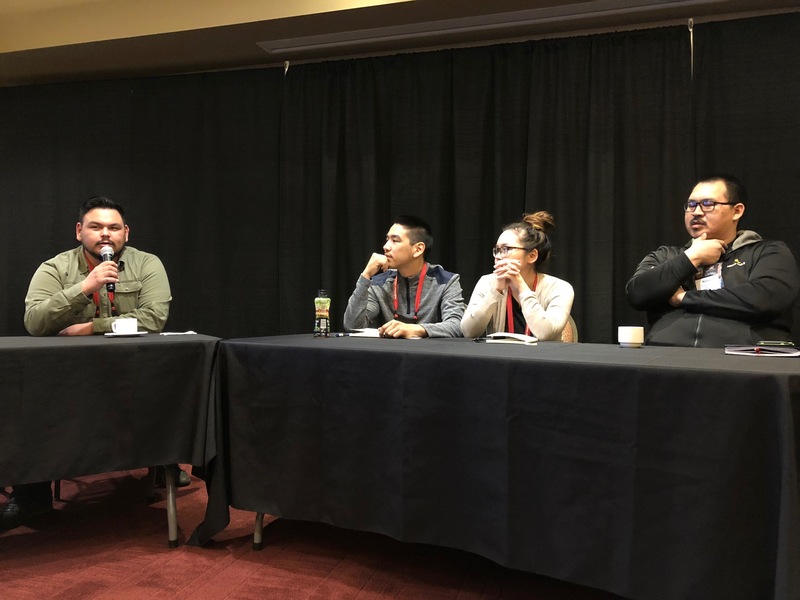 They selected six youth ambassadors from the communities closest to Nunavut’s mines—Pond inlet, Cambridge Bay and Baker Lake—to attend this week’s Nunavut Mining Symposium in Iqaluit, where they received some extra input on the industry. Four of those selected participated in a panel on April 4, the final day of the symposium, where they shared their ideas on how to get youth keen on mining jobs: bring students to a mine, encourage geologists and other mine workers to visit the schools, provide more education on the various jobs available, and help Inuit receive training for them. One successful example of student outreach mentioned at the event is a Trades and Skills Week offered to high school students in Baker Lake by Agnico Eagle Mines Ltd.
Ideas on how to bring youth to mining also came from those listening to the panel, such as Michelle Buchan from the Kitikmeot Inuit Association, who raised the need for in-school guidance counsellors. Tara Arko, the director of technical services at the Nunavut Impact Review Board in Cambridge Bay, offered the example of a NIRB program that brings high school graduates in as junior technical advisors and then trains them to work for the regulator. Graduates of Yellowknife’s Akaitcho Hall, who attended the session, talked about their trades course at the residential school that closed in 1996. This saw them driving around on heavy equipment in a kind of industrial arts course not found today in Nunavut. As it turned out, two of the youth panelists, Lee Qammaniq, now of Iqaluit, and Nolan Aupaluktuq of Baker Lake, already work for mines: Qammaniq as a heavy equipment operator, now in his second rotation at Baffinland’s Mary River mine, and Aupaluktuq, working for several years at Agnico Eagle’s Meadowbank gold mine, also as a heavy equipment operator. Aupaluktuk, who receives special on the job training, said he expects to spend his entire career working at the mine. As for Lance Akoluk, whose father is a longtime worker at the Hope Bay site, now operated by TMAC Resources Inc., he said he doesn’t have many friends who are “too interested in working at a mine,” mainly because they don’t know what it’s like. “But there is a lot of money to be made and I hear it’s pretty nice,” he said. Morgan Carter from Cambridge Bay said that before the symposium, she didn’t know much about mining, but now she is looking forward to going back home to talk more about it with her girlfriends. But getting the message out to youth about all the jobs available at mines continues to be a challenge. “It can be a puzzle to connect with youth,” said the panel moderator, Alex Buchan, TMAC’s vice-president of corporate social responsibility. Buchan said he became interested in mining while he was growing up in Kugluktuk, during the time when diamond mines were developed close by and there were many meetings on the new developments. Today, the community meetings that he organizes in western Nunavut on behalf of TMAC attracts mostly adults and elders. But they’re not the target group for future mine workers. “I know you like to learn things in a way that’s different from your parents and grandparents,” Buchan said.